I have been covering the sport of boxing for more than two decades. It’s probably my favorite sport — for a number of reasons. The number of African American fighters, the raw unscripted rags-to-riches stories of Mike Tyson, Floyd Mayweather and the Peterson brothers make it a natural fit for minority media coverage. Last week I attended the show at the Home Depot Center in Carson that was headlined by Antonio Tarver and Winky Wright. The venue was a perfect mesh with the combatants who fought from sun up till sun down. A crowd of roughly 2500 attended and half the crowd was Hispanic and the other half Black. 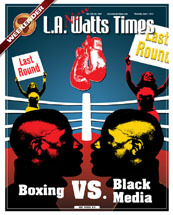 However, the promoters — Golden Boy, Gary Shaw and Tarver — did nothing at all to reach out to African Americans beyond the usual email press blast from the bevy of publicists working the event on behalf of them, cable networks and Showtime. There are few businesses that are thriving during this troubling economy. This very newspaper and its legendary brother publication, the Sentinel, are among the enormous family of African American or minority publications that are hurting. For decades, when there wasn’t pay-per-view or tailor-made advertising partnerships, minority newspapers such as these were the foundation of media support and marketing outreach for the sport of boxing. It was during these times that it was the one sport that granted us the same open access as our White contemporaries. Legendary boxing promoter Don King was a pioneer in this effort; he recognized the power and influence of Blacks and their economic spending might by sharing the advertising revenue among the Black-owned newspapers as owner of which now Mr. King is one of us as owner of Cleveland’s Call and Post Newspaper. For far too long in recent years, traditional team sports and leagues, such as the NBA, NFL and MLB, have ignored the Black press altogether. While boxing is not regulated and promoters have their own individual agendas to pad their pockets and expand their relationships, they too have fallen short of sharing their revenues with the Black press. Because our advertising revenue is not what the daily majors are, and because our circulation numbers are not what the daily majors are, is not an excuse. It costs a publication such as this one and others to send out a reporter and have that individual expense his own parking. Let it be a Mayweather mega fight in Las Vegas, and the expenses are 100 times that. The recent event at the Home Depot Center made money, most of it coming from the Showtime network and some from paid sponsors, but none of that calculated profit was spent to enhance the event with Blacks that would have increased their profit sharing. There’s plenty of blame to go around for this short sightedness. It starts with promoters such as Bob Arum, Golden Boy, Goosen Tutor and, yes Mayweather, and, in last week’s fight, Tarver. Then there’s also an underlying responsibility of the Black press: If these sports are not helping us, then why should we help them — even if some of our own are involved? This week is another huge example in which unheralded Timothy Bradley is fighting Manny Pacquaio in Las Vegas on pay-per-view. Bradley is an undefeated Black fighter. There is a major advertising budget spinning its marketing wheels during the NBA finals on ESPN and TNT. For a fraction of that cost, they could have included a buy with the Black press. If these folks don’t think we are important and the dollars of Blacks are insignificant, then let’s show them. Encourage Blacks top not buy their fights on pay-per-view. It’s time to pull off the damn gloves on the sport of boxing and fight back.